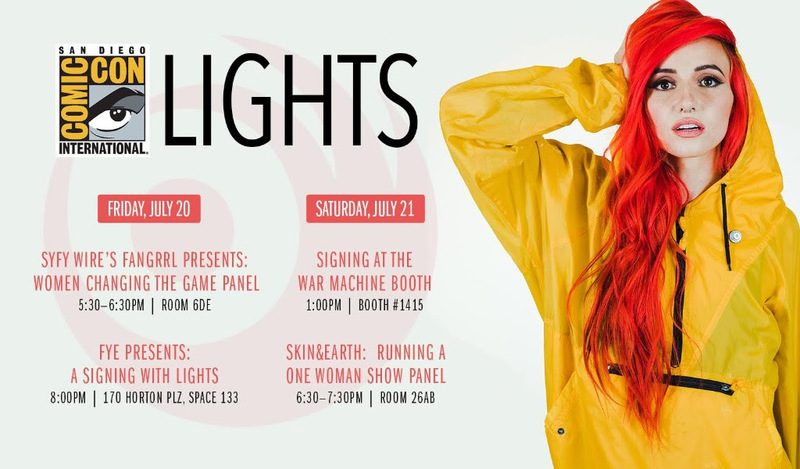 Pop sensation Lights is set to return to San Diego Comic-Con once again to promote her new graphic novel, Skin&Earth. 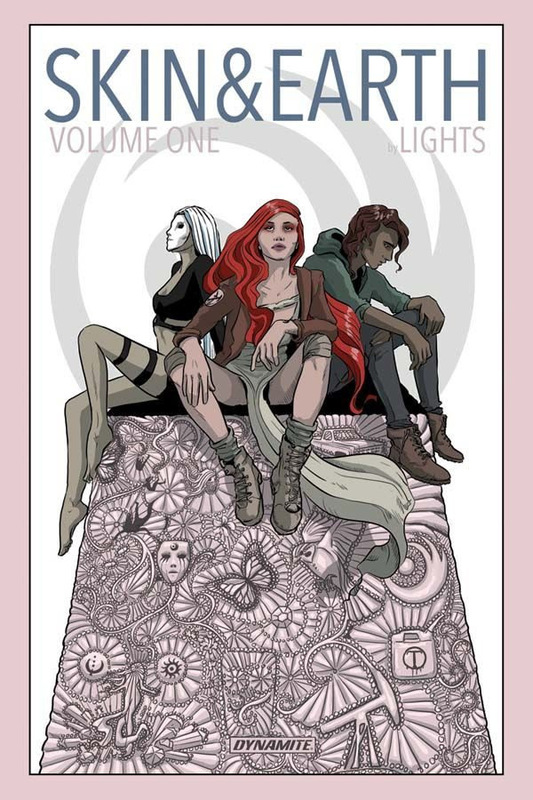 Announced today, Lights breakout comic series Skin&Earth is slated for television, digital and gaming adaptation through global entertainment company eOne. On Friday, July 20, Lights will be appearing on Syfy WIRE’S FANGRRL presents panel in Room 6-DE at 5:30 PM. Following the panel, Lights heads to the FYE Pop-up located at Westfield Horton Plaza at 8 PM for a Q&A and signing. On Saturday, July 21, Lights will have a book signing on the show floor at San Diego Comic-Con at the War Machine Marketing booth #1415 from 1PM-2PM prior to her panel discussion. Lights will take the stage inside the walls of Comic-Con in Room 26AB at 6:30 PM to speak about her one-woman journey creating a comic/music crossover in publishing and what’s in store for the future. “I spent a good two years of my life writing, drawing and building this world and bringing this series to life, and Comic-Con is a rewarding opportunity to celebrate these works we love and care about so much,” added artist Lights. The signed hardcover edition of Skin&Earth collects all six issues of the acclaimed comic book series along with variant art from Jim Lee, Joby Harris, Derek Lewis, Gianna Rose and Matt Mitchell and an all-new introduction from Lights as well as custom interactive share codes to access the full album, music videos and other bonus content. Skin&Earth is a story of a girl looking for hope in a hopeless world. Caught between romance and cults, gods and mortals, and just trying to find a good borscht, Enaia Jin is lead down a dark path by new lovers that reveals a twisted fantasy world and her own true nature. The landscape of sci-fi has changed – and we’re never going back. Women aren’t just making some of the best, most groundbreaking work in the genre today, they’re also redefining what it means to be a fan. Moderated by Cher Martinetti, Fangrrls’ Managing Editor, this panel will feature accomplished female writers, actors, producers, and creators chatting about their current obsessions and discussing how they are blazing their own path and changing the industry. Starting at 10 am on Friday, July 20th, be one of the first 150 fans to purchase Skin&Earth Vol. 1 from the artist LIGHTS from the FYE Pop-Up Shop located in Westfield Horton Plaza and you will receive a wristband that gains you access to the autograph session on July 20th. • Wristbands can only be obtained with the purchase of Skin&Earth from the FYE Pop-Up Shop located in Westfield Horton Plaza. • Each fan through the line must have a wristband and their own copy of Skin&Earth. • Wristbands are limited – First come, first served. Collected for the first time as an interactive trade paperback and hardcover, Skin&Earth—the original story and 14-track record, all written, illustrated, colored and recorded by Lights herself, can finally be experienced as one cohesive vision. Join Lights as she talks about her vision with an introduction from Nick Barucci (publisher at Dynamite Entertainment) and a Q&A moderated by Franki Chan (founder IHEARTCOMIX).